How do we Close The Gap in Aboriginal and Torres Strait Islander people’s health? Hep C tests at Bluesfest! The Champion has already given an overview of the Fifth National Hepatitis C Strategy (>>>click here) and Third National Hepatitis B Strategy (>>>click here). In this edition we present a summary of the Fifth National Aboriginal and Torres Strait Islander BBV and STI Strategy 2018-2022 (to read the report >>>click here). The report acknowledges, “Aboriginal and Torres Strait Islander peoples continue to be disproportionately impacted by blood borne viruses and sexually transmissible infections.” Overall, there have been a few achievements reported since the last strategy, and some key challenges still to be addressed and overcome. Hepatitis B: In 2016, there were 176 notifications for Aboriginal and Torres Strait Islander people – 13.5% higher than the non-Indigenous population. At the end of 2016, it is estimated that over 24,000 Aboriginal and Torres Strait Islander people were living with chronic hep B infection (3.7% prevelance). Hepatitis C: In 2016, there were 1,122 notifications for Aboriginal and Torres Strait Islander people – 38.4% higher than the non-Indigenous population. There is limited information on the uptake of testing and treatment for hepatitis B. In a 2016 survey, 19% participants reported treatment for hep C in the last 12 months, an increase from 3% in 2015. However, lifetime and recent uptake of treatment was lower in 2016 compared to non-Indigenous participants. Improving the collection and reporting of this field remains a priority area for BBV and STI surveillance. Continued decline in hep B notification rates in younger age groups. Uptake of sexual health services by young Aboriginal and Torres Strait Islander people increased. The proportion of respondents from an Aboriginal and Torres Strait Islander background participating in the Australian NSP Survey increased. There was progress in efforts to integrate sexual health services with primary health care. Over the past five years, new diagnoses for several BBV and STI, including HIV, hepatitis C and syphilis, have increased significantly among Aboriginal and Torres Strait Islander communities. This may reflect an increase in testing—a key achievement of the previous strategies—but they could be a very concerning trend. The target of the previous strategy to increase the use of sterile injecting equipment for every episode was not met. There is currently limited data on treatment uptake among Aboriginal and Torres Strait Islander people living with hep B and hep C.
There was an increase in the proportion of Aboriginal and Torres Strait Islander people who inject drugs and attended NSPs. Over 2012–2016, there was a 25% increase in the notification rate of new hep C diagnoses in the Aboriginal and Torres Strait Islander population. The rate in the non-Indigenous population remained stable. Although the notification rate of newly diagnosed hep B halved from 2012 to 2016 in the Aboriginal and Torres Strait Islander population, in 2016 it was 1.4 times greater than the rate in the non-Indigenous population. The limited progress demonstrated against the targets of the previous national strategy indicates that a revitalised response is needed. An understanding of the social determinants that lead to this greater impact is required to ensure high-risk priority groups are effectively engaged. Significantly reduce the transmission of BBV and STI among Aboriginal and Torres Strait Islander people. Close the gap in BBV and STI incidence, prevalence, testing and treatment rates between Aboriginal and Torres Strait Islander and non-Indigenous populations. Reduce morbidity and mortality related to BBV and STI. Minimise the personal and social impact of BBV and STI. Minimise the negative impact of stigma, racism, discrimination, and legal and human rights issues on Aboriginal and Torres Strait Islander people’s health. Achieve and maintain hep B childhood vaccination coverage of 95% at 12 and 24 months. Increase the use of sterile injecting equipment for every injecting episode. Reduce the number of newly acquired hep C infections by 60%. Increase the proportion of people living with hep C who are diagnosed to 90% and the cumulative proportion who have initiated direct acting antiviral treatment to 65%. Increase the proportion of people living with hep B who are diagnosed to 80%; receiving care to 50 %; and on antiviral treatment to 20%. Reduce hep C attributable mortality by 65%. Reduce hep B attributable mortality by 30%. Reduce the reported experience of stigma among Aboriginal and Torres Strait Islander people with BBV and STI, and the expression of stigma, in relation to BBV and STI status. Hepatitis NSW, along with our Close the Gap 414 Working Group partners from 414 Elizabeth St, held a very successful Close The Gap event on Thursday 21 March. Close the Gap Day is an opportunity to send our governments a clear message that Australians value health equality as a fundamental right for all. Following a Welcome to Country by Mr Allen Murray from the Metropolitan Local Aboriginal Land Council, the event was kicked off by two songs from Redfern’s own drag artist, Nana Miss Koori, performing on her father’s country, Gadigal land. Kevin Heath, the Senior Aboriginal Health Promotion Officer, with South East Sydney Local Health District’s HARP unit then spoke about Aboriginal health generally, and specifically about his tremendous work with Indigenous youth. Other speakers included Close the Gap 414 Working Group representatives – Kerry Walker (Hepatitis NSW), Annaliese Constable (SWOP) and Jordan Wimbis (ACON). Nana Miss Koori helped wrap the successful and well received event with a rousing rendition of Jessica Mauboy’s We Got Love. So what has Hepatitis NSW been doing in consideration of Close The Gap? 2019 Yabun Festival in Camperdown. 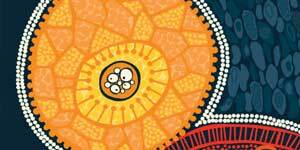 Six Aboriginal focused hepatitis education sessions, to be delivered in Moree and Brewarrina. As a final note, Hepatitis NSW has been working with Reconciliation Australia to finalise our Reconciliation Action Plan (RAP). We are very excited to advise that this has been provisionally approved and we hope to officially launch this document during NAIDOC Week in July 2019. The following article is an edited excerpt of the speech given by Kerry Walker – Hepatitis NSW’s Aboriginal Project Officer – at our Close The Gap event last week. Close the Gap is an Australian Government strategy that aims to reduce disadvantage among Aboriginal and Torres Strait Islander people, with respect to life expectancy, child mortality, access to early childhood education, educational achievement, and employment outcomes. Major contributing factors to Aboriginal Australians lower life expectancy and poorer health outcomes originate from the effects of colonisation. Between one third, and one half of the life expectancy gap, may be explained by differences in the social determinates of health. They affect the health of people and can also influence how a person interacts with health and other services. Australian politicians have held many campaigns to motivate people to work together to close the gap. Several of these campaigns are still running, but showing signs of minimal approval among Indigenous Australians. The latest report card on STIs and BBVs is not good for Aboriginal and Torres Strait Islander peoples (see article above). So what is going wrong, why is it that the health gap is either remaining the same, and in some cases widening? Most programs have been led by non-Indigenous people, and despite evidence it hasn’t and isn’t working, very little has changed. Basically Aboriginal and Torres Strait Islander people do not have a voice and input in how things should happen. For example, the Statement from the Heart is a proposal by Aboriginal and Torres Strait Islander people. It would be a constitutional reform that to establish a constitutionally enshrined First Nations’ representative body that would advise parliament on policy affecting Indigenous peoples. Despite public willingness to consider its proposals, the key proposition – for a constitutionally enshrined Indigenous voice to parliament – has yet to gain bipartisan support. The former Prime Minister Malcolm Turnbull said the proposal was neither “desirable nor capable of winning acceptance at referendum”, and that it was “inconsistent with democratic principles because only Indigenous Australians would be able to be or elect members of the representative body”, and would “inevitably become seen as a third chamber of parliament”. Instead, the government announced a joint parliamentary committee to consider the Uluru Statement in the context of other proposals for constitutional reform. And as Patrick Dodson states, “The longer we leave the command of the jurisdictions over us, the greater we become disinherited”. Bluesfest is Australia’s premier contemporary blues and roots music festival, showcasing music from around the world every Easter long weekend just north of Byron Bay. Hep C is already a ‘rock n roll’ brand, with a considerable impact on people associated with the music industry – for a brief who’s who list of some of them>>>CLICK HERE! It also happens that, because of the event’s demographics, a number of the thousands of people attending Bluesfest may be living with hep C.
Luckily, Hepatitis NSW was selected to have a charity stall at the festival providing testing for hep C and information on new Direct Acting Antiviral hep C cures. Clinical and non-clinical staff of public liver clinics from Lismore, Port Macquarie, Coffs Harbour, and ACON Northern Rivers – plus Hepatitis NSW – will volunteer their time and expertise at a stall within the festival. Anyone at Bluesfest is welcome to visit us from Thursday 17 to Monday 22 April. The stall will offer Dried Blood Spot (DBS) hep C testing for NSW residents. DBS is a self-collection method (not a self-test) where people collect samples and receive results later confidentiality, by SMS, email or phone call, and the person is linked to a service of their choice for follow-up. We will also offer free information resources, factsheets, booklets, and talks with trained hepatitis community and health workers. 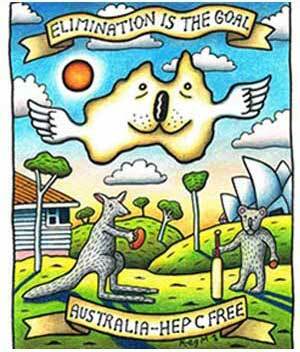 T-shirts will be on sale with a specially-designed “Hep C Elimination in Australia” graphic by Reg Mombassa from Mental as Anything (see pic, right)! Hopefully musicians and MCs will make announcements about the importance of people who might be living with hep C to go for testing and seek treatment. So if you’re going to Bluesfest, or know someone who is going, we’d love to see you at our stall! Hepatitis NSW spent a couple of days out in the beautiful Central West NSW area this month. 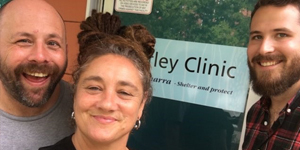 Members of our Live Hep C Free program partnered with colleagues from NUAA to deliver education workshops, and to also encourage and assist people into hep C testing and treatment at priority settings in Orange and Bathurst. We visited opioid treatment services, alcohol and other drug services, faith-based organisations, and a residential rehab. We met some truly incredible and inspiring people across the region. We can’t wait to head back out in May to continue our support for the great work being done around hep C across the state.